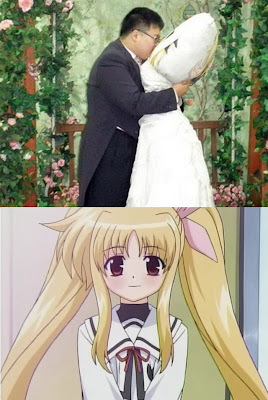 Last December, my pointless posted a story about a man who married a Nintendo anime character that he fell in love with. This week, we have the true the story of a man in Korea who recently married his pillow. Lee Jin-gyu has fallen in love with his "dakimakura" which is a large body-sized hugging pillow. The pillow bears the image of his favorite anime character, Fate Testarossa. The 28-year-old Lee takes his pillow-friend with him everywhere. They go to the park and stroll together. They ride amusement park rides together. They even go out to eat at restaurants. Pillow-Testarossa doesn't each much, but she sits patiently in her own chair and enjoys spending time with her pathetic fiancée. Last week, Lee dressed up his pillow-love in a wedding dress and married her in a special ceremony in front of a local priest.